The kids woke up early upon hearing that they would be going to an amusement park – Lotte World. This would be their first time to an amusement park. What they know is what they have read from books or seen from television programmes thus far. Nonetheless, they were excited and I, too, was excited to spend the day in a fantasy land. We arranged to meet Daddy at Jamsil Station Exit 4 as he was off early in the morning to Noryangin Fish Market. The kids were impatient when Daddy was late so I brought them to the entrance of Lotte World (a mere 5 minutes walk from Exit 4 through the underground shopping mall) and introduced to them the different characters in Lotte World. The two main characters for Lotte World are Lotty and Lorry and needless to say, they liked the female character better, Lorry. The mytical foundation just at Jamsil Station Exit 4, outside Lotte Departmental Store. 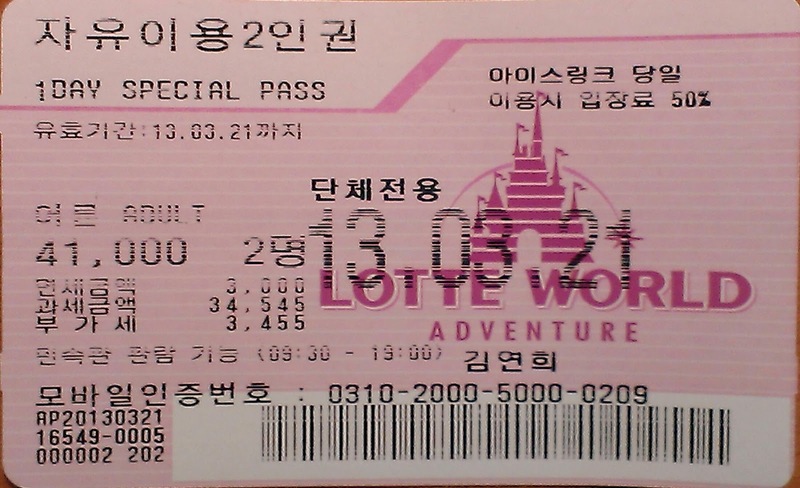 Admission charges for Lotte World are as follows – General Admission (without rides and theatres) 25000won. A special package ticket which includes all rides will cost up to 40000won. For a child, it works out to be 19000won and 33000won respectively. If you go after 4pm, it would cost more. We had wanted to get an adult general admission ticket, one adult special package ticket (so that one of us can ride with the kids if need be) and 2 children special package tickets but the ticketing staff informed us of a special promotion – 1 adult and 1 child special package ticket costs only 41000 so we got two instead. There is also an ice-skating rink inside Lotte World but you would need to get tickets separately. You can get 2000won off your ice-skating tickets if you show your Lotte World entrance tickets. Do remember to hold onto your tickets. You would be required to show your tickets before any rides. Once we walked up the escalator, the whole place opened up and so did the girls’ eyes and mouths. There were so many things going on at the same time – sky monorail, tea-cups, high flying balloons, parade – lots of sights and sounds to stimulate even the adults. The kids started giving directions, “Go here, go there!” The day was theirs so we let them take the lead – for once. Crossing the skybridge to Magical Island, an outdoor play area with castles! The assistants were all very friendly and took great care to ensure that the kids were safely secured. But what was happening over there? The girls were cheering because Daddy was so brave! We spent a while just looking at the brave souls "go up and come down" (as put by the girls). I couldn't help but scream whenever they dropped. Next up, a train ride. A was happy to be the train driver. A number of the rides and admission are for older patrons so we kept to the safe kiddy rides. Admission into places like haunted house was not an option for us since we always watch what we put into our children. If you visit in winter, do note that not all rides are available, such as the Waikiki Wave. You wouldn't want to be in the winter cold riding the waves anyway. Even though it was cold in the Magical Island, the fun kept the cold at bay and we were able to enjoy ourselves thoroughly. Not anymore for Mummy. She was screaming throughout the drop. Daughter was brave throughout. Cute little carts could be seen everywhere around Lotte World, selling Lotty and Lorry accessorries. With lots of pattern organizations to go with it! We checked out of Ibis Myeongdong that morning and checked into Novotel Gangnam which is nearer Jamsil. Lotte World has a hotel and they even have themed rooms for the children but as it was way of our budget, we chose another hotel. By the time we got to Novotel, everyone was drained and hungry. We opted for an early dinner so that everyone could have an early rest. 5 minutes from Novotel is a strip of restaurants known as the 'Gangnam Street', coined by the locals. It is just outside Exit 4 of Sinnonhyeon Station on Line 9. It was starting to get cold as night fell and we went into the first Korean barberque restaurant that we saw, just what we were looking for. Sheltered and warm, and ready to eat! Steamed egg, comes free with the basic set. You can order more at additional cost. At the restaurant, it was necessary that you order the basic set of meat (36000won) before you can order the other dishes like Kimchi Jigae (5000won). You can also top up the meat (pork neck or pork belly) and pay accordingly. The best Kimchi Jigae we have eaten so far. We finished one in a jiffy and ordered another one. We had to stop ourselves from ordering the third one! Here came the star for the dinner. A tong and a pair of scissors were provided. You can cut the meat into smaller pieces so that they can cook faster. Our table was so full of dishes that we had to use an empty table beside ours. The dinner costed us 54000 and that included all drinks and extra bowls of rice. Refills of side dishes are free in Korea so we had our fill too. An excellent way to finish the night of fun and play. 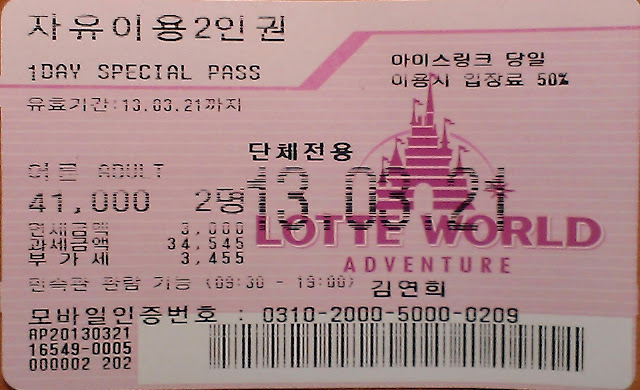 I still remember lotte world! My sis dragged me up the vertical drop! I was freaked out! It went up high but v v slowly and without a waning, *whooosh* you drop down in a flash! Hi there! The younger girl was about 90cm, but I do not recall her taking many rides aside from the ones featured here as she was not that adventurous. I guess it depends on whether your tall 2 year old is willing to give it a try. The milder ones should not be too much of a problem especially if you can accompany her. Hi Joshua & Bryant's mummy. We're back, and this time we spent a little time at a section for younger children. They are over a metre tall and aged four and five. The section is indoors on the ground floor, and there were mild activities and rides such as the bumper car for kids, train rides, simple merry-go-rounds. See: http://withkidswego.blogspot.kr/2014/03/seoul-day-4-back-to-lotte-world.html. Hi Melvia. If I remember correctly, the magic pass includes admission and all rides. Have fun!